This mod replaces the 1970's helmet with a flat black helmet with a custom logo, and replaces the 2000's silver pants with black and silver pants, and replaces the 1970's socks with black socks. 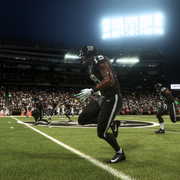 Download Oakland Raiders Blackout Uniforms. This is a mod for Madden NFL 19 video game.